2. 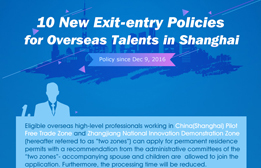 If one of the parents is a Chinese citizen, the Chinese citizen must be a Shanghai resident or applied for going abroad in Shanghai. e. One recent 2-inch half-length, bareheaded and full-faced photograph. Such child must go through such formalities within one month as of the birth. c. The copies of the passports or identity certificates of the parents. V. Fee Standard: Free for nationality examination; charging according to the fee standard for credentials for emigration papers.